Vancouver is a pretty cool place. We’ve got mountains, ocean and some other pretty fab things going on. But behind a beautiful (when it’s sunny) facade, we bet there are some things you didn’t know. Read on curious one and let us know what other quirky facts you’ve heard about Vancouver. Vancouver is a pretty cool place. We’ve got mountains, ocean and some other pretty fab things going on. But behind a beautiful (when it’s sunny) facade, we bet there are some things you don’t know. Would you like fries with that? The first time McNuggets were made on Canadian soil was in Richmond in 1967. At one time, this famed Vancouver Art Deco building was the tallest in the British Empire. Formally a logging settlement on the Burrard Inlet, what now is the City of North Vancouver was once called Moodyville, named after Sewell Moody who set up a sawmill. There’s now a park there. The bridge connecting downtown Vancouver with West Vancouver was originally built by the Guiness Beer Company to provide access to a residential development, the British Properties. In 1886, most of the newly incorporated city was burnt to the ground by the Great Vancouver Fire. Originally started to clear land near Main Street, this fire destroyed all but a few structures. Coming second to New York, Vancouver is the largest port of North-America, in both tonnage & physical size. Also, we boast one of the major cruise ship ports in not just North America, but the world. Many cities in the GVRD have sister cities worldwide. Burnaby’s is Kushiro, Hokkaidō, Japan which donated the totem poles on Burnaby Mountain. Vancouver has six including Los Angeles and Edinburg. The British Properties originally required you to have a British Passport to live there and many groups of people were excluded from this residential settlement. At BC Place, Vancouver has a one-of-a-kind retractable roof, which just so happens to be the largest in the world. It reveals over 7,500 square metres of sky. Our Pride Parade is 1 of the largest in the world & attracts over 500,000 people. 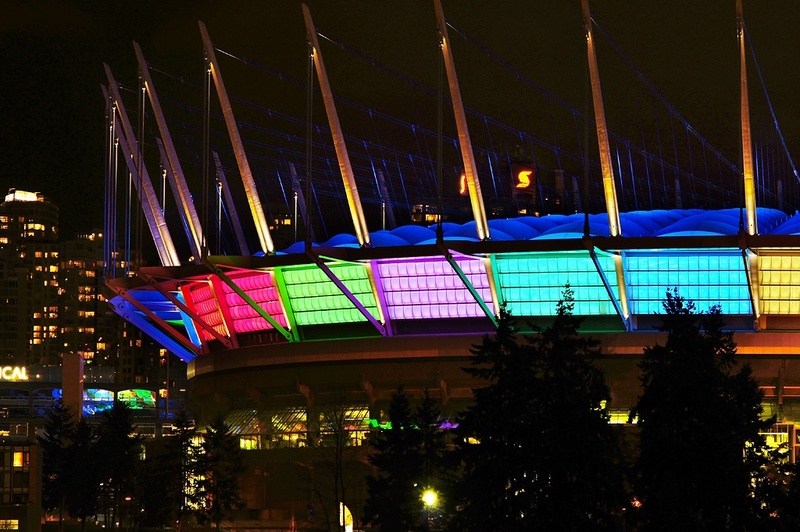 Davie Street & the West End is a hub for the LGBTQ+ Community with inclusive night clubs, events, festivities & more. Kitsilano’s salt water pool is 137.5 meters (451 ft) which is about the size of 3 Olympic pools. This outdoor pool has a temperature of 25C (77F) so you will always be warm, regardless of the weather! Vancouver’s largest (and most popular) public park is 1001 acres, making it 10% bigger than New York City’s Central Park. If you haven’t heard, it recently won an award too! Hidekazu Tojo, a British Columbian Hall of Fame Chef, just so happens to be the inventor of the California roll. You can still go to his restaurant, Tojo’s, at 1133 West Broadway. When you are riding the SkyTrain and cross the Fraser River, you are utilizing the world’s longest cable-supported transit-only bridge, the Skybridge. A group of activists from Vancouver came together to try & stop nuclear bomb testing in Alaska. While their mission was unsuccessful, Greenpeace is the world’s most visible environmental organization. Although it can be frustrating as a driver, it’s fantastic when you live here. Vancouver is one of the few North American cities with no freeways in the city.